(Gland, Switzerland, 26 August 2015) – A new platform to enable consumers to make energy-smart choices launched today in Chile, the first in Latin America. The website, supported by WWF, allows consumers to compare the energy consumption of products such as light bulbs, electrical appliances (including refrigerators, freezers and televisions) and cars, to enable more sustainable purchases. Topten Chile (http://www.top-ten.cl/) is a tool adapted by Fundación Chile and supported by the Ministry of Energy and WWF-Chile to promote energy-efficient products. Reducing energy use is an important factor in the fight against climate change, and also has the benefit of cutting electricity costs for consumers. Chile’s 17-million citizens consumed about 67 billion kWh of electricity in 2012, which is approximately 30% higher than the world average and the same as China on a per capita basis. Increasing energy efficiency measures is a crucial step to achieving the country’s national energy strategy target of a 12% reduction of forecasted energy demand by 2020. The global Topten network to promote energy efficiency was born in 2000 in Switzerland and currently has national websites in China and 16 European countries. A brand new assessment shows that Topten contributes to an increased market share of energy-efficient appliances and an amount of 15 to 18 terawatt hours in terms of cumulative savings since 2006, which corresponds to a reduction of 7.5 to 9 million tons of CO2 emissions. With the launch of Topten Chile, the country is the first in the region with this platform. About WWF - WWF's mission is to stop the degradation of the earth's natural environment and to build a future in which humans live in harmony with nature. The Global Climate & Energy Initiative (GCEI) is WWF’s global programme addressing climate change, promoting renewable and sustainable energy, scaling up green finance, engaging the private sector and working nationally and internationally on implementing low carbon, climate resilient development. 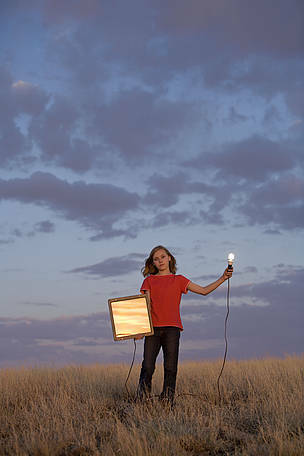 A young girl using solar energy through a photovaultic panel to lpower a lightbulb.